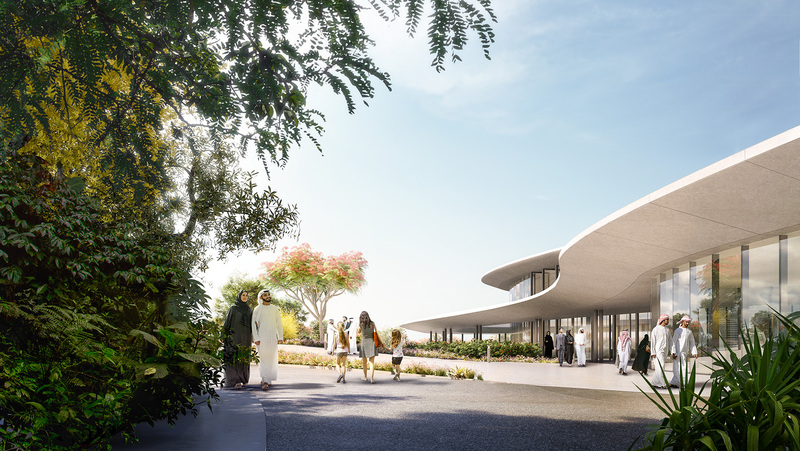 The focal point of the US$6.5 billion Aljada development in Sharjah, the Central Hub by Zaha Hadid Architects is a new leisure and entertainment destination for the UAE that defines Aljada’s role as a transformational project for Sharjah. The Central Hub’s design conceptualises the first moment a water droplet strikes the earth’s surface, captured in an array of elliptical buildings that are designed to channel prevailing winds into public spaces and courtyards to aid natural cooling. Arada’s commitment to sustainability and smart technologies is integrated within the Central Hub. 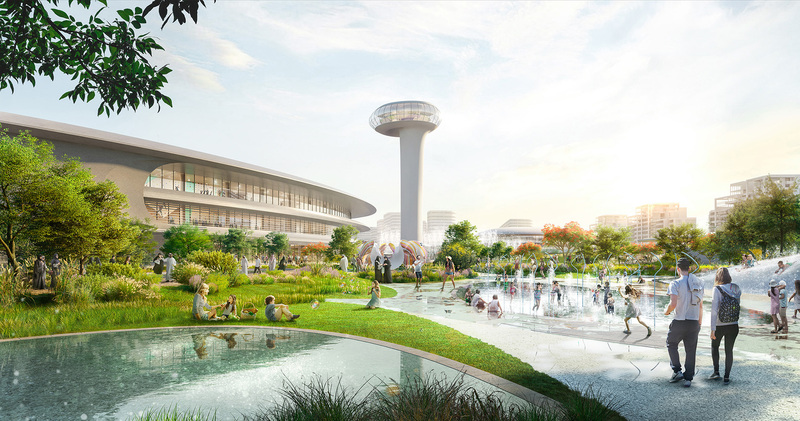 The complex’s natural ecosystem, irrigated by recovered and recycled water, is designed to sustain a microclimate at ground level for gardens featuring plant species native to the region, while the Central Hub’s lighting requirements will be entirely provided by smart solar power. More than 25 football fields in size (1.9 million square feet), the car-free Central Hub is focussed around its large central plaza and public observation tower. The Central Hub’s design integrates a variety of civic spaces designed with natural cooling strategies to enable them to be enjoyed throughout the year, even during the summer months. In total, there will be 732,000 square feet of public squares and gardens within the Central Hub, including the large community park that covers a quarter of the complex with thousands of specially selected native trees and plants. Work on the first phase of the Central Hub – which will include an outdoor cinema space, a food truck village, skate park and other family-friendly facilities – has already begun and is scheduled to be completed by the end of the first quarter of 2019. Arada is on track to complete all phases of the Central Hub by 2022. Children’s play area, outdoor activity zone and skate park. Outdoor event space for film screenings, pop-up events and markets. Waterplay area (65,000 square feet in size). Extreme sports centre including a skatepark and climbing wall. ‘Edutainment’ complex for families, which features a virtual reality zone and children’s science and discovery centre. Two retail zones, that include food halls for farmers’ markets. Community park, over 340,000 square feet in size, featuring hundreds of species of trees and plants as well as a number of outdoor sports facilities, such as tennis and basketball courts. Arada has recently confirmed that Aljada will be one of the UAE’s smartest projects, with next-generation technologies to offer residents and visitors the most convenient and efficient living. The Aljada masterplan is carefully designed with walkability and wide green spaces in mind, allowing residents, workers and visitors the ability to live, work and play within a fully integrated and sustainable community. Zaha Hadid, founder of Zaha Hadid Architects, was awarded the Pritzker Architecture Prize (considered to be the Nobel Prize of architecture) in 2004 and is internationally known for her built, theoretical and academic work. Each of her dynamic and pioneering projects builds on over thirty years of exploration and research in the interrelated ﬁelds of urbanism, architecture and design. Born in Baghdad, Iraq in 1950, Hadid studied mathematics at the American University of Beirut before moving to London in 1972 to attend the Architectural Association (AA) School where she was awarded the Diploma Prize in 1977. She founded Zaha Hadid Architects in 1979 and completed her ﬁrst building, the Vitra Fire Station, Germany in 1993. Hadid taught at the AA SchooI until 1987 and has since held numerous chairs and guest professorships at universities around the world. She is currently a professor at the University of Applied Arts in Vienna and visiting professor of Architectural Design at Yale University. Working with senior ofﬁce partner, Patrik Schumacher, Hadid‘s interest lies in the rigorous interface between architecture, landscape, and geology as her practice integrates natural topography and human-made systems. leading to innovation with new technologies. The MAXXI: National Museum of 21st Century Arts in Rome, Italy and the London Aquatics Centre for the 2012 Olympic Games are excellent manifestos of Hadid‘s quest for complex, ﬂuid space. Previous seminal buildings such as the Rosenthal Center for Contemporary Art in Cincinnati and the Guangzhou Opera House in China have also been hailed as architecture that transforms our ideas of the future with new spatial concepts and dynamic, visionary forms. Zaha Hadid Architects continues to be a global leader in pioneering research and design investigation. Collaborations with corporations that lead their industries have advanced the practice‘s diversity and knowledge, whilst the implementation of state~of-the-art technologies have aided the realisation of fluid and therefore complex architectural structures. Currently Zaha Hadid Architects is working on a multitude of projects worldwide including: the High-Speed Train Station in Naples; the CityLife masterplan and tower in Milan; the Library & Learning Centre at the Vienna University of Economics as well as major master-planning projects in Beijing, Bilbao, Istanbul and Singapore. 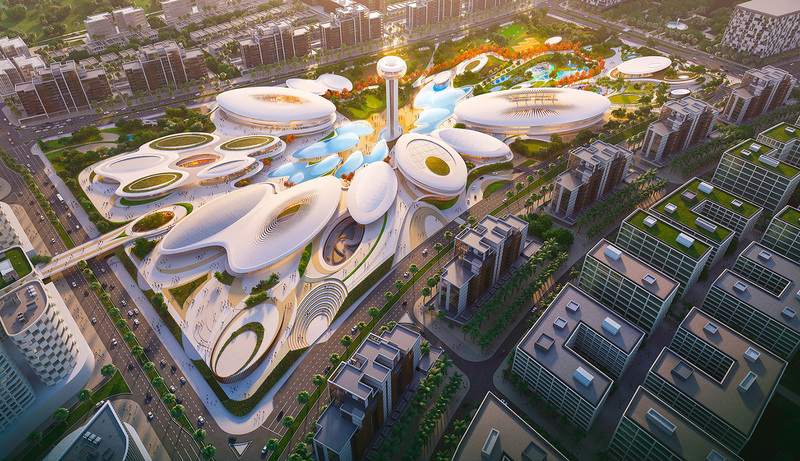 ZHA’s portfolio also includes cultural, corporate, academic and infrastructure projects across Asia, the Middle East, Europe and North and South America, in addition to national institutions such as the new Central Bank of Iraq Headquarters. Zaha Hadid Architects‘ work of the past 30 years was the subject of critically-acclaimed exhibitions at New York’s Solomon R. Guggenheim Museum in 2006, London‘s Design Museum in 2007, the Palazzo della Ragione, Padua, Italy in 2009, the Philadelphia Museum of Art in 2011 and the Danish Architecture Centre in 2013. Her recently completed projects include The Eli & Edythe Broad Art Museum in Michigan (2012), Galaxy SOHO in Beijing (2012), Pierresvives Library and Archive in Montpellier (2012), CMA CGM Head Ofﬁce Tower in Marseille (2011), London Aquatics Centre (2011), Riverside Museum in Glasgow (2011), Guangzhou Opera House (2010), Sheikh Zayed Bridge in Abu Dhabi (2010), MAXXI Museum in Rome (2009), Burnham Pavilion in Chicago (2009), Mobile Art for Chanel in Hong Kong, Tokyo, New York and Paris (2008) and the Nordpark Railway Stations in Innsbruck (2008). Hadid‘s outstanding contribution to the architectural profession continues to be acknowledged by the world‘s most respected institutions including the Forbes List of the World‘s Most Powerful Women and the Japan Art Association presenting her with the ‘Praemium lmperiale’. In 2010 and 2011, her designs were awarded the Stirling Prize, one of architecture’s highest accolades, by the Royal Institute of British Architects. 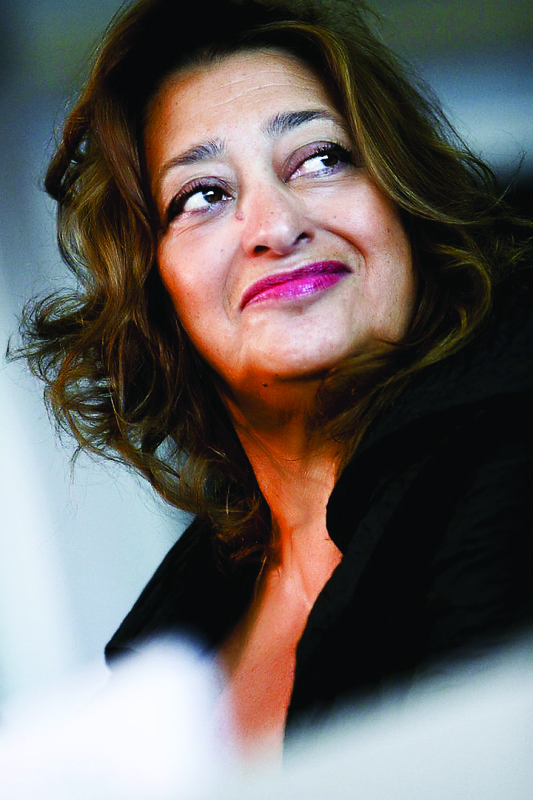 Other recent awards include UNESCO naming Hadid as an ‘Artist for Peace’, the Republic of France honouring Hadid with the ‘Commandeur de l‘Ordre des Arts et des Lettres’, TIME magazine included her in their list of the ‘100 Most Inﬂuential People in the World‘ and in 2012 Zaha Hadid was made a Dame Commander of the Order of the British Empire by Queen Elizabeth II.